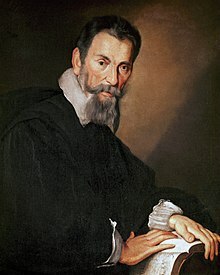 Claudio Giovanni Antonio Monteverdi was an Italian composer, string player and choirmaster. In English, his name is sometimes spelled Monteverde. "Claudio Monteverde," by William Henry Grattan Flood in Catholic Encyclopedia, (ed.) by Charles G. Herbermann and others, New York: The Encyclopaedia Press (1913). This page was last edited on 1 January 2018, at 02:50.